TGCET Notification 2019 Telangana Gurukulam CET 5th Admission Test Online Application form TS Residential School 5th Class Admission Online Application, Fee, Last date for Apply Online, Important dates, Selection process, Test centers, Hall ticket, Results Download. TGCET 2019 for TS Gurukulam / Residential Schools 5th Class Admission Common Entrance Test 2018 Telangana Residential CET Notification 2019 TG Gurukul CET 2019 TGCET Online Application form, TMREIS 5th Class Admission, TS Gurukulam Entrance test Syllabus, MJPTBCWREIS Admission Test Exam Pattern, TSREIS, TSTWREIS, TSWREIS Admission test Online Application at tgcet.cgg.gov.in. TS Residential Schools has released 5th Class Common Entrance Test 2019 SC, ST and BC Welfare Residential Schools for the academic year 2019-2020 TS Gurukulams 5th Class Common Entrance test 2019 Notification, TG Gurukul CET 2019 Hall Tickets,TS Gurukulam 5th class admissions Counselling Dates, Telangana Gurukulam 5th class Common Entrance test for Telangana Gurukuls, TS Residential Schools 5th Class admissions Test Results. TS Gurukulam CET 5th class admission application form, last date for apply, application fee, eligibility criteria, selection process, exam Syllabus Exam Pattern, Hall tickets and results more details at http://tgcet.cgg.gov.in/. Who are Eligible and interested students can apply through online TGCET official website http://tgcet.cgg.gov.in/ from 19-02-2019 to 16-03-2019 and Rs.50/ registration fee for submission of online application. SC and ST students have born between 01-09-2006 to 31-08-2010. Students are studying 4th during the academic year 2018-19 in any Government School or any recognized school in Telangana State. 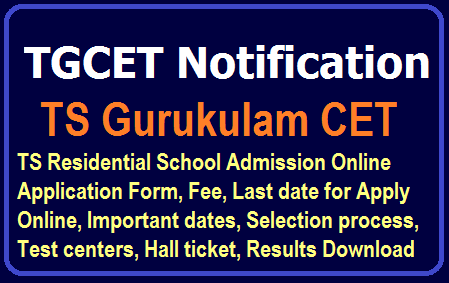 Tags : TG Gurukul CET 2019, MJPTBCWREIS Notification, Residential CETs Online Application form, TG Gurukul CET Hall tickets, TGCET Counselling Dates, TMREIS, TS GURUKULAM, TS Residential Schools 5th Class admission Results, TS Residential CET Certificate verification, TSREIS, TSTWREIS, TSWREISTS Gurukulams 5th Class Common Entrance test 2019, TS Gurukulam 5th class admissions 2018, Telangana Gurukulam 5th class Common Entrance test for Telangana Gurukuls. TGCET 5th Class Admission Notification 2019, Telangana Residential School Online Apply, TS Gurukul CET Online Apply Schedule 2019 Telangana Gurukul CET 5th Class Admission Test Exam date, Hall tickets Download.